The CD59 antigen, also known as Protectin or Membrane Inhibitor of Reactive Lysis (MIRL) is a 18-20 kDa, single-chain, glycosylphosphatidylinositol (GPI)-anchored cell surface protein. CD59 inhibits complement lysis by binding to the C5b-8 and C5b-9 complexes and thus preventing formation of the polymeric C9 complex during the final steps of membrane attack complex (MAC). 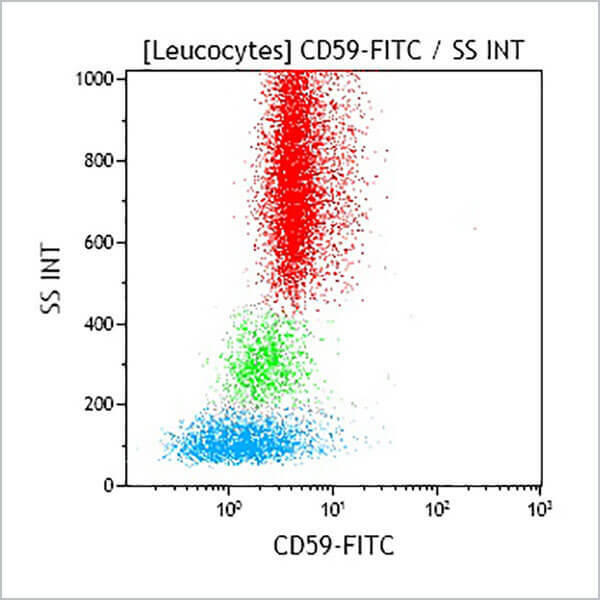 CD59 is expressed on all haematopoietic cells and is widely expressed on cells in all tissues. Studies of the susceptibility of HIV-1, HTLV-1 and HCMV to complement (C)-mediated lysis suggest that viruses incorporate host cell-derived C regulatory proteins such as CD59 and CD55, a mechanism by which a variety of enveloped viruses may acquire resistance to C-mediated lysis.